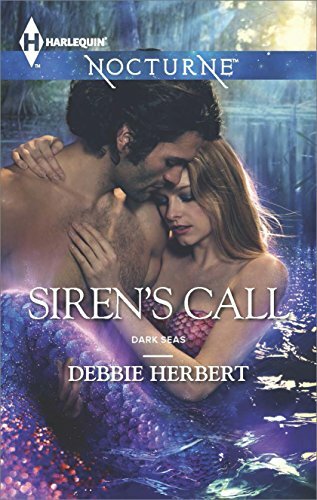 Siren’s Call by Debbie Herbert is the superb conclusion to the Dark Seas trilogy about the Bosarges of Bayou La Siryna, Alabama. Lily Bosarge is the quintessential mermaid. She has the long blonde hair, large blue eyes, luminous skin, and the siren voice which compels men to do her bidding. Although she has dated almost every man around and longs for love, she has never experienced it. As soon as she realizes she can’t return a man’s feelings, she breaks things off, but her long list of conquests has turned the women against her. They are all afraid she will steal their men, sometimes with good reason. Though she doesn’t quite realize or understand the pain she has provoked in others, Lily has caused a lot of damage to couples in the area. When Lily’s childhood friend, Nashoba Bowman returns, Lily is drawn to him from the moment she sees him. However, he treats her with barely a fraction of the warmth they once felt for one another and seems immune to her siren voice. Lily can’t understand it because he’s the first man ever to be unimpressed by her charms. The more he avoids her, the more she’s hooked. Nash isn’t unaffected by Lilly, but he’s come back to the bayou for a reason. He has a job to do, and once he’s finished it, he’ll leave. He doesn’t have time for a fling. Women fall too hard and fast for him and get hurt when he moves on. All he wants is to spend time with his elderly grandfather and photograph the local wildlife, but someone has other plans for him, plans that could lead to danger for any woman close to him. I loved this book, which brought the last of the Bosarge women to her destiny. Siren’s Call had romance, suspense, satisfying growth by Lily and Nash, and the opportunity to enjoy the characters from the first two books, Siren’s Secret and Siren’s Treasure, which feature Shelly Bosarge and Jet Bosarge. In my opinion, Lily was the hardest of the three to warm up to in the first two books. She acted cold and insensitive to her effect on men and the damage it did to the women whose husbands or boyfriends dumped them to pursue Lily. Ms. Herbert does a magnificent job of showing Lily’s growth as she develops empathy for others and regrets her past dalliances. Despite her beauty and gifts, Lily is vulnerable. She feels the pain of rejection by the women of the town but won’t let anyone see it. She longs for love but doesn’t think she will ever experience it herself. By keeping the secret of her mermaid nature, she creates distance between herself and Nash, nearly ruining their relationship and putting herself in danger. Nash is complex and nuanced. He has the looks and magnetism to draw Lily to him, no matter how often he pushes her away. However, he has secrets of his own and shuts down if she tries to get too close. Lily and Nash must overcome tremendous obstacles, both internal and external, if they are to have a chance at happiness. I don’t want to include any spoilers in this review, so I will only say I teared up at the end of the book. I bet you will too.